There are some very clear discrepancies on U.S. government websites regarding the penny. On the U.S. Department of Treasury website, it states, “Each penny costs .81 of a cent to make, but the United States Mint collects one cent for it. The profit goes to help fund the operation of the United States Mint and to help pay the public debt. In 2000, this profit added up to about $24 million.”(Source One, Source Two (page 53). So the reasoning to make the penny still is that it is profitable. Wait. A profit of $24 million in 2000? Interesting that this document doesn’t suggest times have changed. In 2004, that profit was reported to be $1 million (Source page 45). In 2010, the annual report states, “Strong relative demand for the penny and nickel coins reduced the return from circulating operations because these denominations are made at a loss.” The profit in 2010 was non-existent. The actual numbers resulted in a loss of $27.4 million (Source Page 28). In 2011, the loss is now over $60,000,000. That’s 60 million dollars. If we were still in the year 2000, beginning the process to end the penny would make sense. One should withdraw from a business activity once it starts to become unprofitable. 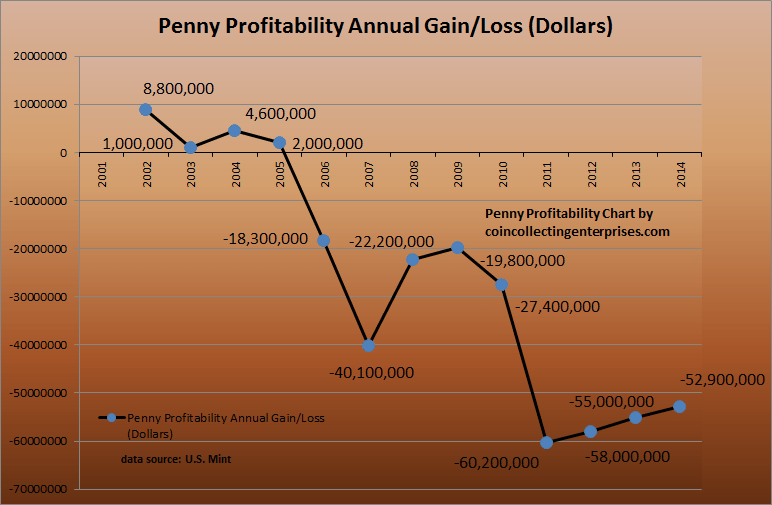 Penny profitability was achievable in 2000. However, let’s face facts. The U.S. Mint is a business to generate income. And if something is not profitable, then it should not be made. Didn’t know the Mint has aims to generate income? Did you know the U.S. Mint hedges silver? “The United States Mint has adopted a hedging program in FY 2006 to avoid fluctuation in silver costs as a result of the volatile changes in market prices. The United States Mint purchases silver in large quantities and sells an interest in that silver to a trading partner, while maintaining physical custody and title of the silver” – Source (page 58). Clearly the U.S. Mint operates like a business. A business must stay profitable or it fails. When a business manufactures a product and makes money, that equates to success. If the cost to produce that product does not outpace the revenue acquired for manufacturing, then that product is not profitable to make. This is basic economics. The penny can not stay if it is not profitable.